In a bid to ease mobility challenges for its partners when working to ensure increased access to justice for most vulnerable members in society, the Department for International Development (DFID) has, through its Justice for Vulnerable Groups (JVG) Programme, presented 3100 bicycles to the Catholic Commission for Justice and Peace (CCJP) and 60 motorcycles and 100 bicycles to the judiciary. Since 2011, the UK has, through JVG, supported community and district mechanisms to prevent violence against women and children and support traditional and formal justice systems to be more accountable and responsive to women, children and detainees. The 3100 bicycles that have been handed over to CCJP will support a nationwide network of community based educators (CBEs) to effectively carry out their work in the community of training local tribunals, supporting citizens to access justice and resolving local disputes. On the other hand, the 60 motorcycles and 100 bicycles that have gone to the judiciary will, respectively, support lay magistrates to be more responsive to the needs of people in rural areas and Court Clerks and Court Marshalls to deliver summons, coordinate court camps and expedite the justice process. 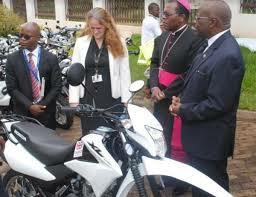 DFID’s Head of Office in Malawi, Jen Marshall, said the donation of bicycles and motorbikes will help ensure sustainability of everybody’s efforts to date to increase access to justice for the most vulnerable. Representing CCJP during the handover of the bicycles, the Archbishop of Lilongwe Diocese Tarcizio Ziyaye thanked the UK government for equipping CCJP’s officers with bicycles to effectively do their job in rural areas. For his part, the head of Malawi Judiciary, the honourable Chief Justice Andrew Nyirenda SC, said the assets would help the judiciary to reach the greater part of community that is in rural areas. “These motorcycles and bicycles will certainly allow us to take justice to the greater part of our community where we have the majority of the vulnerable groups. In distributing these resources, we must therefore undertake to mainly target rural courts; that we will do,” Justice Nyirenda said. JVG has come to a close in 2017 and a new gender-based violence programme will be launched sometime in the year. In the just-ended programme, the UK worked with four main partners—the Paralegal Advisory Services Institute (PASI), UNICEF, CCJP and the Judiciary.